If you don't think cheerleading is a real sport, Shannon Phelps has an open invitation for you. "Come to a practice - we'll throw you," says the Saints cheerleader with a devilish smile. "Or you can try and throw somebody, and we'll see how that goes." When it's game time for Saints football, hockey, and basketball cheerleaders, you won't find them just standing on the sidelines clapping. "We're athletes just like everybody else, and trying to gain the respect of the school and the community," says Phelps, co-captain of the football cheer squad. Under the leadership of coach Becky Brenna, the squads have stepped up their game by adding some high-flying stunts. 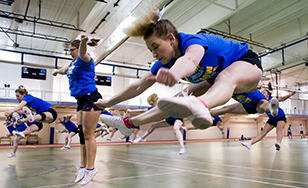 As part of their summer training they attend a rigorous practice camp with University of Minnesota cheerleaders. The event provides priceless experience, but 7-hour days packed with "stunting" practice aren't for the faint of heart. "It's hard to see a light at the end of the tunnel when you're only one hour in and your arm's already shaking so bad that you feel like you couldn't hold a Q-tip," said hockey cheerleading co-captain Nicole Kapaun. "It's intense." But the experience promotes bonding. "We really do become a family throughout the year," Kapaun said. Trust and communication is a must, especially with stunting. "Cheer is a very up-close and personal sport," Phelps said. "You're grabbing people, you're catching people - you have to be comfortable with everybody around you." It's also a major time commitment. In addition to practicing for at least two hours twice a week, they run and lift weights to stay in shape. They also volunteer together, teaching cheer routines to children at the Boys and Girls Club and ringing bells for the Salvation Army. The roar of the crowd after a flawlessly completed stunt makes it all worthwhile. "People think it's easy," Phelps says, "which makes it fun to prove them wrong." Learn more on the cheerleaders' blog or follow them on Twitter or Facebook.